Ye also said something about people coming over on boats (“We came over in the same boat. Now we all in the same bed....Maybe different boats”). Very different boats... This was followed by the premiere of his video for “Fade,” which stars a glowing, impossible-bodied Teyana Taylor in a sweaty “Pleasure Principle” meets Flashdance moment. I am Kanye West. And that feels really great to say, especially this year. I came here to present my new video. But before I do that, I’ma talk. My wife is a G. Not a lot of people’s wives would let ‘em say that right there. We came over in the same boat. Now we all in the same bed. Well, maybe different boats but uh... But if you think about last week, there was 22 people murdered in Chicago. So I was speaking at the Art Institute last year and one kid came up to me and said, “Three of my friends died and I don’t know if I’ma be the next.” And you have to think, like, you know when you’re a senior and it’s the last month and you just don’t feel like doing anymore work. If you feel like you seeing people dying right next to you, you might feel like, what’s the point? Like life could be like, start to feel worthless in a way. I know times for me, I sit down and talk to older, rich people, you know. A.k.a white. They tell me don’t compare yourself to Steve Jobs, don’t compare yourself to Walt Disney. And my friend Zakaya told me...there’s three keys to keeping people impoverished, that’s taking away their esteem, taking away their resources, and taking away their role models. My role models are artists, merchants, less than 10 that I can name in history: Truman, Ford, Hughes, Disney, Jobs, West. Brooo. Broooooooooooo! Tonight, we here to have fun. I’m standing in front of my idol Puff Daddy. I’m standing in front of my wife Kim Kardashian West. I’m standing in front of the future, Chance the Rapper. 2 Chainz, Jaden Smith. Bro, we are undeniably the influence, the thought leaders. I’m gonna play y’all a piece of my art and I just hope y’all have a good time. Play that. 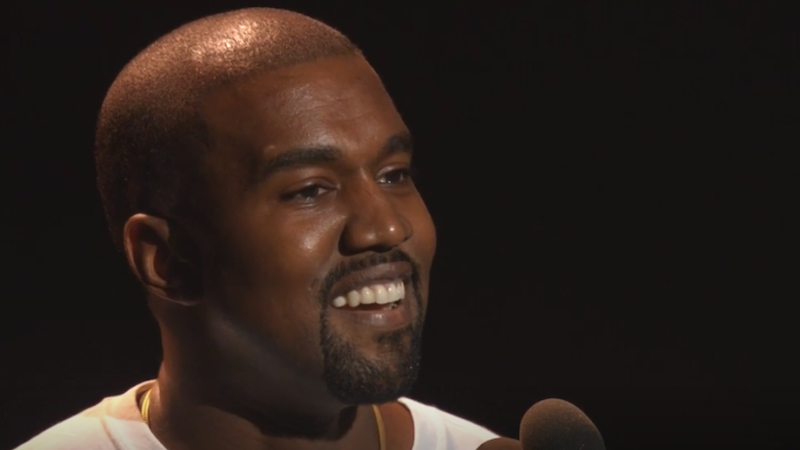 Do You Think It&apos;s a Good or Bad Idea That the VMAs are Giving Kanye Free Rein?